You are currently browsing the category archive for the ‘Second Life’ category. 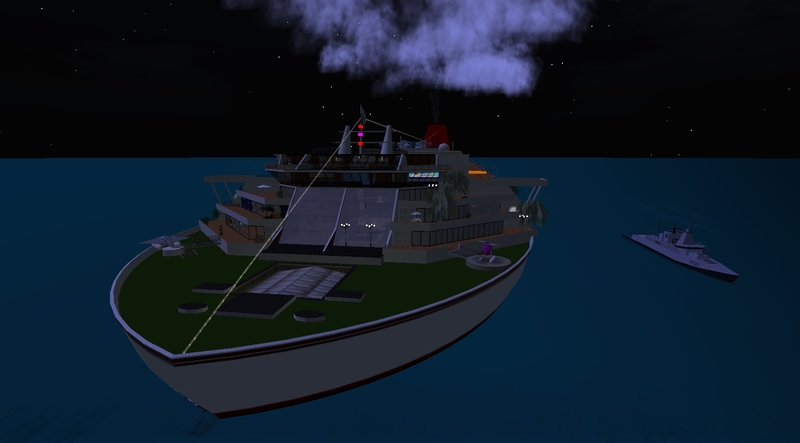 One of the wonders of Second Life, the S S Galaxy is a huge and elegant ship build, created by Bill Stirling, which stretches across three sims, and includes accommodation, shops, restaurants, a ballroom, and more. I’ll let the pictures do the talking, and encourage you to pay a visit. For even more photos, see my Snapzilla album. If you have Second Life installed, you can teleport to the S S Galaxy. Temp-on-rez is a prim setting which will keep a prim ‘alive’ for a fixed amount of time, after which it will be removed. It is a very handy feature with a number of legitimate uses, the most common of which I suppose are bullets and vendor displays (which temporarily rez examples of the items for sale). Unfortunately it is sometimes used as a way of circumventing Second Life’s prim limits. There are gadgets you can get which will essentially keep temp-on-rez items permanently alive (basically they re-rez the items every time the temp-on-rez reaches its time-out). If you’ve been tempted by these gadgets, or if you’re actually thinking of trying to create one, please, please don’t. The prim limits are there for a reason. The more prims there are in a sim, the heavier the load on the Second Life servers. Using the temp-on-rez to bypass the limits simply increases the load, and makes the Second Life experience even worse than it already is, not only for other users but for you (the temp-on-rez abuser!) yourself. Second Life is struggling enough as it is. Don’t make it worse. 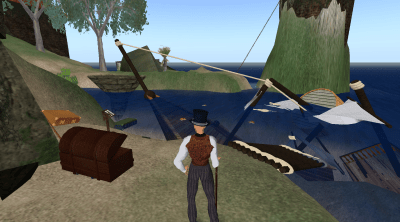 Second Life has long had a system for displaying video on a prim. This is the parcel-media system, whereby you can supply a URL for a video feed, and the video will be displayed on an assigned texture (if you have never seen this before, the set-up for it is on the last tab of the About Land dialog). Its main restriction has been (and still is) that only one video can be displayed on each parcel of land. You can have any number of prims displaying the video, but they will all display the same video. It has always been possible to display output from a web-site to the parcel media stream, although it was never easy. If you are interested, it involves creating a CGI script on a web-site to generate an image. 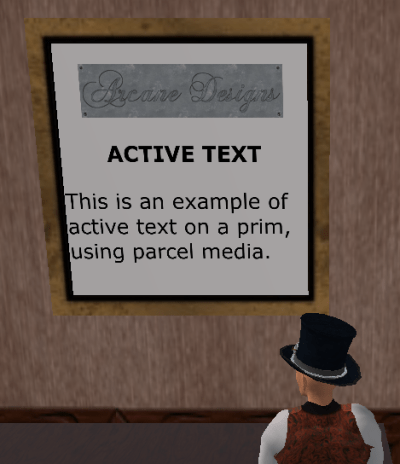 By then pointing the parcel-media URL at this script, the image will be displayed on any prim which uses the parcel-media texture. I experimented with this myself a little while ago, and got a system up and running which would display text which was ‘chatted’ by an avatar. I had ideas about creating some sort of live broadcast system. Unfortunately, the Quicktime vulnerability then appeared, and for some time anyone with any sense kept parcel-media switched off. I stopped experimenting at that point, and didn’t go back to it even after the vulnerability was fixed. 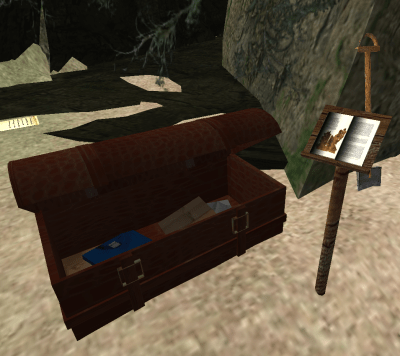 The more recent versions of Second Life include the ability to directly display a web-page via the parcel-media. Point the parcel-media URL at a web-page, and the page will be displayed on the parcel-media texture. This brings us a step closer to the long-promised HTML-on-a-prim, but we aren’t quite there yet. For a start, this system only applies to parcel-media, and hence suffers from the same restrictions that parcel-media suffers from. There are also some quirks in the way in which the web-pages are displayed. The main problem that I have found is that the pages seem to rendered at a fixed size (it looks to be something like a 1024 x 1024 area). If the webpage is too large to fit this, scroll-bars will appear. 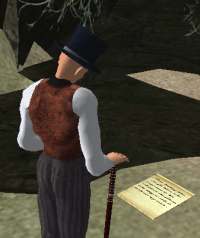 Of course, because the page is essentially just displayed as an image, these scroll-bars are inactive in Second Life. It also means that you have to display the page on a fairly sizeable prim in order for a normal web-page to be readable. It would have been nice to have the ability to display only part of the web-page, with it sizing to fit the prim. So much for the background. Now, how can we make use of this? Obviously, we can just display a web-page, but there other things that can be done, such as creating genuinely active text. That’s what I want to demonstrate in this post. It is going to be rather simplistic and limited, but it should be quite easy to extend the basic idea into something more sophisticated and useful. To make particular example work, you will need a website that handles PHP, and that you can upload files to. You will also need to own or rent a parcel of land that you can change the parcel-media on (obviously!). // Get the text to display. // Only works with PHP compiled as an Apache module. This would display a web-page with the line “This is a test.”. A couple of other points: the code above includes a line to read the owner key, but doesn’t make any use of it. In a real situation you would probably want to use this as the basis for some kind of security (remember that anyone with a browser can call this script!). There are also a number of other headers which are available — see the LSL Wiki for more information about them. Also note that I have set the font-size to a rather large 64 points! This is so that the line of text will show up at a reasonable size on our display. Now for the Second Life side. For this example we will set up a script that will listen on a specified channel, and will use our web-script to display anything which is chatted on that channel. We will also set up a timer that will automatically clear the text and replace it with a default after 30 seconds. In this example I am using a script on my own website — you should replace the URL with the appropriate path for your own site. You can make use of the script on my website if you want to just try things out, but it will display my own logo, and is not guaranteed to stay on the website for long, as it is only a test. Create a prim, and apply your parcel-media texture to one face. Create a script in the prim, and replace the default contents with the above code. Anyone who stands near the prim and chats on the specified channel will have the chat displayed on the prim (provided, of course, that they have video switched on). 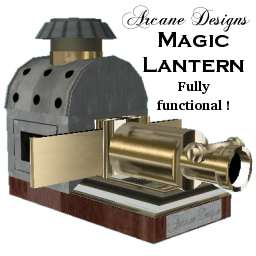 I have recently completed my first significant gadget for Second Life, a functioning reproduction of a Victorian Magic Lantern. 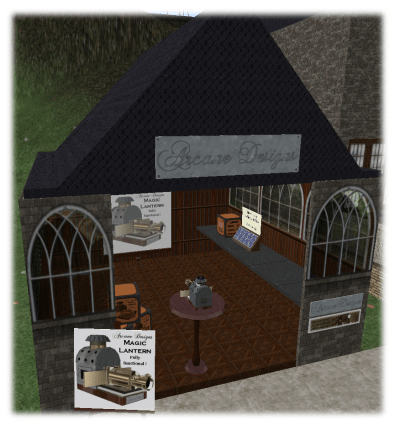 To show it off, and to make a place for selling both it and other things I might create, I’ve built a small store, Arcane Designs, next to Morgridge Mansion. 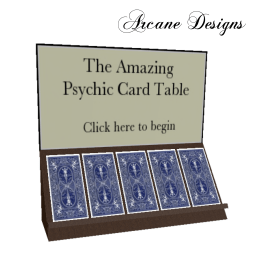 As a matter of fact, I’ve already got a second item on sale, which is my Psychic Card Table, a Second Life version of a card trick which I have seen elsewhere on the Internet. It has been on display in the Mansion for some time, as a sort of conversation-piece, but I’ve decided I might as well put it on sale. Both items are also available from SL Exchange. You want to see them here first? All right, you’ve twisted my arm. 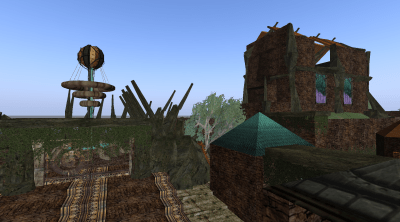 If you have Second Life installed you can use this link to teleport to Morgridge Mansion. It will actually drop you at the hub. Walk north-west to get to the Mansion itself — it isn’t very far. As with all my script posts, I am assuming here that you already know the basics of how to create and edit prims and scripts. I’ve already covered the rotation option for animating textures, in my post about creating a simple rippling water texture. In this post, however, I want to look at the other animation options, and give some examples. The only one I’m not going to cover is the scaling option, which works in a similar way to the rotation option, but which I have never found a real use for. As with all the examples in this post, I am taking the textures from the asset server using their UUID, so they should be available to anyone. Of course, you don’t have to do it this way – you can apply animated textures to the prim in the normal way if you want (in which case you can remove the llSetTexture call in the above example). The texture in this example is 128 x 128, and has the frames laid out in a 3 x 3 grid (the texture was created using the Gimp drawing package). It is actually rather smaller than is necessary, and hence not very high quality. A 256 x 256 version of the texture would be better quality, and would still load reasonably quickly. Let’s look at each of the parameters of the llSetTextureAnim function. The first parameter is a set of flags which are combined together using an OR (the ‘|’ symbol). In my example, only two options are included: ANIM_ON, which switches the animation on (no surprise there!) and the LOOP option, which tells the animation to return to the beginning and start again once it has reached the last frame. The alternative to LOOP is PING-PONG, which still keeps the animation running continuously, but when it reaches the last frame it then plays the frames in reverse until it gets back to the first frame, and so on. If you don’t specify one or other of LOOP or PING-PONG the animation will play through just once and then stop (it will redisplay the first frame, though). We’ll see a possible use for this later. The other possible flags for this parameter are SCALE, ROTATE, REVERSE, and SMOOTH. As I said above, I won’t be going in to SCALE and ROTATE in this post. REVERSE simply plays the animation backwards. I’ll come back to the SMOOTH option later. 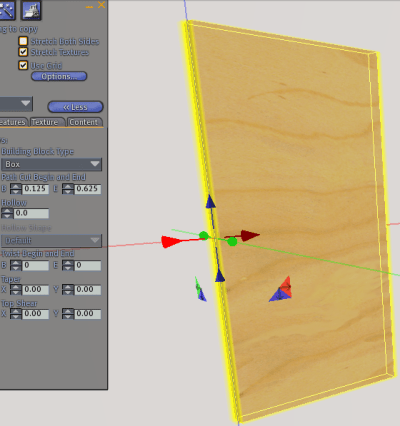 The next two parameters tell the function how the frames are laid out in the texture. In my example, they are laid out in a 3 x 3 grid, so we set both values to 3. A common alternative would be to have the frames laid out horizontally in a long strip. If this sample texture had been done that way we would have had a strip 9 frames long, so these parameters would be 1, 9. The next two parameters tell the function which frames to display, from the first frame to the last frame. You can use this if you only want to display part of the animation (possibly you might want to display different parts at different times). In this case we want to use all the frames. The last parameter is the speed of the animation — the higher the number, the faster the animation. It is approximately (very approximately!) in frames per second, and values between 5 and 15 are usually appropriate, though of course this depends on your animation. Now, what about that SMOOTH option? Well, this works in a rather different way. Instead of displaying individual frame, the SMOOTH option basically scrolls the entire texture sideways. Because of this, it is possible to use this to scroll a texture which isn’t animated (in other words, a texture which isn’t actually a series of frames). Notice that although the texture is not animated, we have specified a Y frame count of 2. This might seem rather odd, and needs some explanation. As soon as you apply llSetTextureAnim, the script will override whatever X and Y repeat values that you have specified, and instead will size the texture to match the X and Y frame count that you have specified, stretching it as necessary. In order to make the texture fill the X direction without stretching, the Y frame-count has been specified as 2, making the script treat the texture as a two-frame animation. Because the start and end frames are both 1, it only displays one frame, which in this case works out as the top half of the texture, with the result that the texture is scaled correctly for us. This is not really an efficient way of doing things! Really, an animated texture needs to have the same X:Y ratio as the prim face that you are going to use it on. Next, something more useful. Let’s see how to use texture animation with Second Life’s waterfall textures, and create a simple waterfall. Start by rezzing a cube, and size it so that it is 2 m wide, 4 m tall, and 0.2 m deep. On the Texture tab, set the rotation to 90.0. This is because animations which use SMOOTH, as we are going to do, always slide along the X axis, so we need to rotate the texture to make our water flow vertically. This now gives us two waterfall animations, running at different speeds. The result is very effective. Near the start of this post I mentioned that if you had neither LOOP nor PING-PONG in the animation flags the animation would run through just once. Here is an example of this. It is a ‘LOCKED’ sign which flashes once when somebody touches it. // Curiously, we have to switch the animation off first. // Now run the animation once. Finding the prim face: You’ll notice that in the above scripts I have specified ALL_SIDES as the side to apply the texture and animation. A lot of the time you will want to put the texture and animation on one side only. The easiest way to find out the side number of a prim face is to use the Advanced (or Debug) menu. To active or deactivate the menu, hold down CTRL+ALT+d on your keyboard. The Advanced menu should appear on the main Second Life menu. Once this menu is showing, edit the prim you want to investigate. Click the ‘Select Texture’ option, and select the face you want to check. Then hold down CTRL+SHIFT+ALT+t on your keyboard. Details of the texture will appear in the bottom-left of your screen, including the face number. Texture Size: remember that a texture with multiple frames can easily be very large indeed, and Second Life still has to load the entire texture (no, it doesn’t load it frame by frame!). Creating an effective animation using a minimum number of frames is a skill in its own right. Yes, I’m finally back. My computer is now healthy and happy again, though Second Life seems to be falling apart. No change there then. I managed to get on-line and stay on-line long enough to collect the pictures for this post, though. Numbakulla Island has been around for some time, and I first came across it a couple of years ago (I think). I’ve been meaning to blog about it for a while, and have finally got round to it. What is Numbakulla? Well, at first sight, it is a rather interesting and well-built island sim, and worth looking round just for its own sake. However, that is not its main purpose. 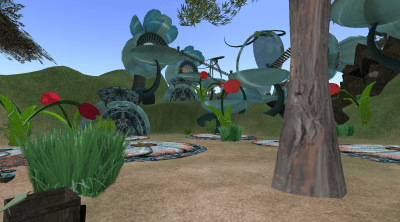 In fact, Numbakulla is a Second Life version of a point-and-click adventure. When you first teleport it, you end on the shore beside a shipwreck. The broken ship is half-sunk in the waters beside you, and books, suitcases, and scraps of paper have been tossed up on the shore or still float on the sea. You are greeted by a notecard, which gives you some explanation about the game and how to play it. Beside you is an open chest and a small stand with a notebook on it. When you click on the notebook, you are given a notebook of your own, which is crucial to the game. You wear this notebook (nothing visible appears, but once you start interacting with things on the island you will get messages from it), and start your exploration. A cave is in front of you, and is the obvious direction to go in, but even as you do so, you come across a scrap of paper on the ground. Click it, and you get your first clue (such as it is) to the game. Then it is through the cave, and out onto the main island, with its curious, plant-like buildings. It will take a little while before you come across your first real hint of the goal of the game and the explanation of the island’s subtitle The Pot-Healer Adventure. In the meantime it is a case of wandering round the island — there is plenty to see — and looking out for things which can be clicked on and interacted with. Such as this pump, which is near the cave exit. It predictably pours water, and your notebook tells you that you need something to collect the water in…but I won’t say more, and so that I won’t spoil the game for you, I’ll refrain from telling you much more about the island, except to say that there is a lot more than just the area which I have shown here. I’ll confess, too, that I haven’t really begun to solve the game myself, and I intend to go back soon and explore the island properly. I hope I’ve tempted you to pay a visit yourself. Have fun. The technology has let me down. I am suffering computer problems at the moment, which is severely curtailing my on-line activities such as this blog, and indeed Second Life itself. If I’ve been rather silent recently (and I have! ), this is the main reason. I hope to back up and running within a week though. Creating a reliable opening door requires a mixture of a specially constructed prim, and a script. Let’s start with the prim. Set the Start Cut parameter to 0.125 and the End Cut parameter to 0.625. You will notice that the pivot centre of the door is now at one edge of the visible part, instead of directly in the middle. This is the key (!) to the way that the door will work — we can now rotate the door very simply, and it will rotate around this hinge point. Resize the result to something suitable for a door, making sure that you keep the pivot centre on the upright edge of the prim. Now for the script. To make sure that the door works correctly regardless of the angle to which it might have been rotated, we must use the Local rotation rather than the global rotation. We will use a variable to keep track of whether the door is open or closed — the only thing to be careful about here is that you must make sure the door is in the closed position at any time when the script is reset. Close the build dialog, and touch the door a couple of times — it should open and close sensibly. It is now possible to link the door to a building, and the door should continue to work properly. The only thing you must be careful about is that door must not be the root prim. If the door is made the root prim, when it rotates it will rotate the rest of the building with it! If the door is a child prim, it will only rotate itself. An alternative is the sliding door. This doesn’t need a special prim — just size a normal cube into the size you want for the door, and use the script that you will find below (but read the rest of this first). The slideBy amount is the amount by which the door will slide when it opens. Usually you will want this to be something a little smaller than the width of the door. 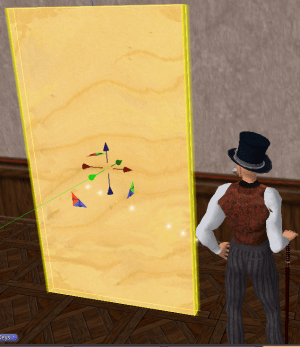 This should leave part of the door visible, assuming, of course, that it is sliding into another prim. We don’t need to use local co-ordinates for this door — the position is always local. However, you need to check which direction the door will slide in. This will normally be either the X or Y axis, depending on which is the width of the door. 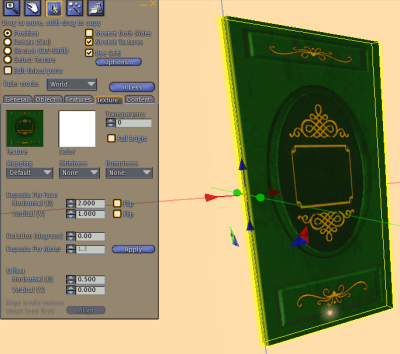 Be careful about rotating the door after adding the script, but before linking the door. For example, here is a rough draft of a door. As you see, it is aligned so that it should slide along the X-axis (the red arrow). 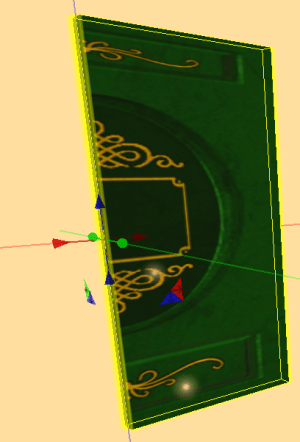 If I rotate the door through 90 degrees, it now needs to slide along the Y-axis (the green arrow) and I will need to change the script accordingly. Once the door has been linked in place, you can rotate the entire object, and the door will still move in the correct direction in relation to the rest of the object. Here’s the script, set to move along the X-axis. // if you want to slide along the y-axis. // so that we pick up the changes. Note: I’ve edited this post to remove the remarks about No Mod, No Copy, No Transfer and Mod, No Copy, No Transfer, when it was pointed out by a couple of commenters that these combinations are actually impossible. I was originally going to write a brief article about the technical details of putting items up for sale, and I will still do that at some point, but as I was writing it I found that I had a lot to say about permissions. As permissions are something you have to give serious thought to if you want to sell things, I’ve decided to devote an entire post to it. I’ll assume that you already know how to set permissions (if you don’t, they are on the General tab of the Build dialog). Permissions are a thorny subject, with wildly differing views. What I am going to do is to examine the ramifications of each option and (more importantly) of each combination of options. I’ll also give my own opinion on each of various options, but you should realise that there are plenty of merchants out there who will have quite different ideas. Be prepared to give the whole subject some very careful consideration! First, let’s look at the individual permissions. 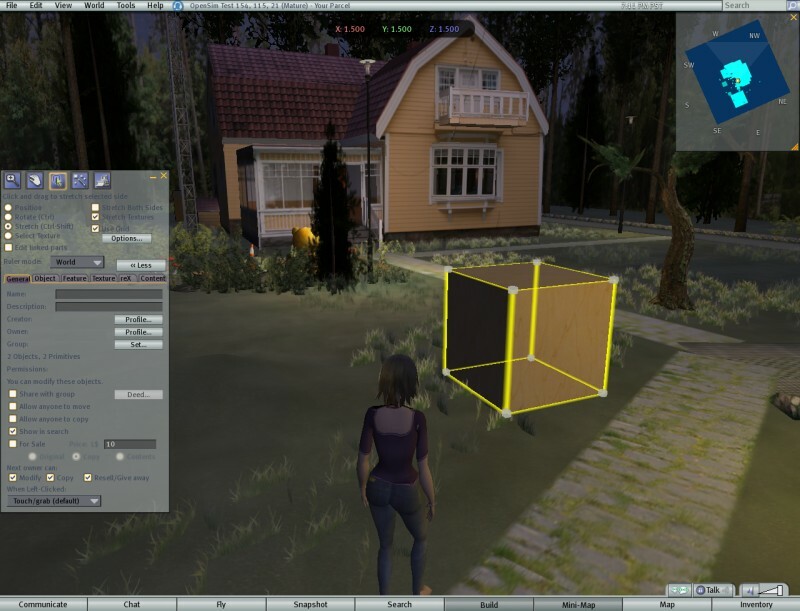 Mod means that the purchaser can freely change the object, using the Build tools. No Mod means that the purchaser cannot modify the object in any way other than simply moving or rotating it. They can’t scale it, they can’t change the textures, they can’t break it up (assuming it consists of more than one prim). For most objects, No Mod is a sensible option. However, if you are selling clothing attachments (for example, hats), you might want to allow modification so that the purchaser can adjust the size of the object to fit their avatar (regrettably there is no way to restrict the types of modification that are allowed — it is all or nothing). In fact, some people might be reluctant to buy such items if they are not moddable. Copy means that the purchaser can create multiple copies of the item (but only for themselves — they cannot pass these copies on to anyone else). This has some less than obvious effects. When a Copy object is rezzed, the original remains in the Inventory. If the owner deletes the rezzed object, they still have the original. If they mod the object (assuming it is moddable), the original is unchanged, and if they wish they can take a copy of the amended object back into their Inventory — they will then have two copies, both the original and the altered copy. No Copy means that the purchaser cannot create multiple copies of the item. They will not be able to Copy and Paste the object within their Inventory (although they can move it around in the Inventory), and when they rez the object it will vanish from their Inventory. Many merchants specify No Copy. Unfortunately, many purchasers (myself amongst them) are reluctant to buy No Copy items. The main reason is Second Life’s notorious flakiness. I have had experience myself of rezzing a No Copy object, seeing it vanish from my inventory, but failing to rez. If you are lucky, it might be returned eventually, sometimes to the Lost and Found folder. More often than not it is gone for good. Or rather, for bad. The other reason for Copy applies to clothes. I have separate folders for each costume that I wear. In many cases these costumes are customised — I have built them by combining clothes from different merchants. Often I have an item that I want to use in more than one outfit, so I want to create copies in several different folders. From my point of view, it is a convenience for me — with No Copy items I would have to go to different folders in order to put together a specific costume. From the merchant’s point of view, I can only ever wear one copy at a time, so they are not losing out (and I’m not going to buy multiple copies just for convenience). Nowadays I hardly ever buy clothing that is No Copy. No Transfer means that the purchaser cannot give or sell the item to someone else. This is a very common option, but there is a catch when the purchaser wants to buy the item as a gift for someone else — this option stops them from doing that. A good solution is to create a special ‘gift’ version of the item, specifying Transfer and No Copy. With this option the purchaser can give the item to someone else, and it will be removed from the purchaser’s inventory. Of course, this goes against what I have said above about No Copy items, but there really isn’t a lot of choice in this case. You probably just need to be prepared to deal with the occasional loss of such gifts, when Second Life fails at the crucial moment of transfer! Mod, Copy, Transfer, and the closely related No Mod, Copy, Transfer. Probably fatal, unless this is a freebie that you don’t mind being copied and given or sold on to any number of other people. For items that you want to make a profit out of, this is a very unlikely combination! Ok, now for the more useful combinations. No Mod, No Copy, Transfer. As I mentioned above, you can use this for items which are to be sold as gifts, but be prepared to deal with the occasional fall-out. Only use this combination if you are also selling a version with Copy and No Transfer options. You could feasibly have Mod, No Copy, Transfer to allow moddable gifts (for the clothing attachments I’ve already mentioned). This is workable, but again be prepared to deal with problems. If the receiver of the gift mods it and breaks it, how generous are you going to be to them when they ask for a replacement? No Mod, Copy, No Transfer. My favoured set of permissions, both for selling and for buying (except for clothing attachments, where I look for Mod as well). Oh, while I’m at it, some merchants sell items with different permissions for different prices. Usually this means a No Copy version and a more expensive Copy version. Personally, I think this is a good compromise — I’m certainly prepared to pay a little more (but not too much!) for a Copy version, and I understand and empathise with the motives behind it. When it comes to permissions, textures are an oddity. They are only usable by the purchaser if they come with full permissions – Mod, Copy, Transfer. This means that once you have sold the textures, the purchaser can do absolutely anything with them, including passing them on to other people. If you think about it, you can probably see why this is the case — if a texture is used on an object which is going to be sold, the texture has to be transferred along with the rest of the object. In a similar fashion, the texture has to have Copy, otherwise the purchaser could only make and sell one single item with that texture. Does this mean there is no point in selling textures? Maybe. Personally, I have sold (and still sell) packages of textures, and make a good profit from them, in spite of my inability to restrict the usage of them. You might prefer not to take the risk. You can, of course, accompany your textures with dire warnings about copyright, and threaten people with DCMAs. It might work, I’ve never tried it. It’s your call. If you want to make textures your central product (and some people, such as Lauren Fox, seem to have done this successfully) you need to decide how much you are going to worry about people copying your work. If the answer is “a lot”, you might want to reconsider. One final point. When you are selling your items, make sure that the permissions for them are clearly visible (either in a nearby advert, or on the box, if the items are boxed). Mod, Copy, Transfer – give-aways/freebies only! No Mod, Copy, Transfer – give-aways/freebies only!